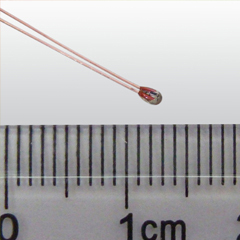 High-Stability-Miniature-Thermistor - Analog Technologies, Inc. Temperature sensing for laser diodes, optical components, industrial process control, etc, where high temperature sensitivity, long term stability, and/or high sensing temperature are required. ATH10K1R25 is of a high stability and high precision glass encapsulated thermistor. Comparing with conventional epoxy encapsulated thermistors, ATH10K1R25 features much wider temperature range, especially on the high end, much better long term stability, smaller size, and shorter response time. In addition, there are two insulation versions available, one of which comes with leads covered by high temperature plastic tubing, the ATH10K1R25T70, and the other one, the ATH10K1R25T70S, is sealed between the head and the tubing. They can work under up to 140°C temperature and the latter is of liquid resistant.